Following our ski of the Hotlum-Wintun on Shasta (see report), David Coleman and I planned to head back north to Mount McLoughlin, the finest ski mountain in the southern Oregon Cascades. However, exhaustion and David's blisters threatened to derail the plan. We drove to Klamath Falls for a big dinner and then camped at Odessa Creek campground near Klamath Lake. 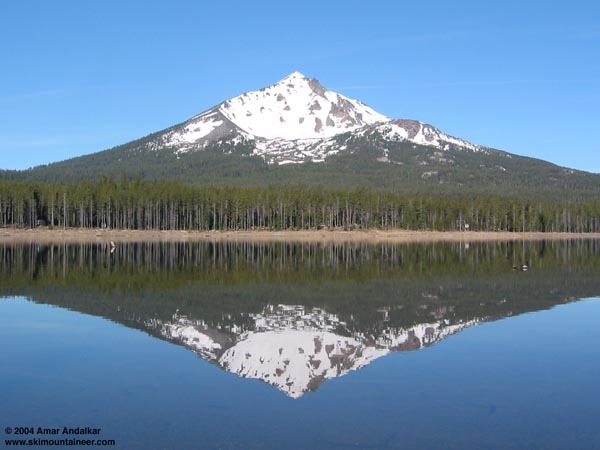 The next morning, we drove to Fourmile Lake for a spectacular view of the Northeast Face of McLoughlin, reflected in the mirrorlike water (for the best view, hike NE from the campground along the concrete dam and then take the trail through the woods to the lakeshore). The awesome sight of the steep face, still completely snowcovered and skiable right from the summit, whetted our appetites, and the pain and exhaustion of the previous day were soon forgotten. The clouds of mosquitoes and flies at the lake sent us scurrying back to the car, and we drove back a few miles to the summit trailhead. The trailhead at 5600 ft was mercifully bug-free, and we hiked up the bare trail just after 9am, leaving skins behind entirely. Overall, the summit trail was only 20% snowcovered, with most of the snow between 6500 and 8000 ft. Above 8000 ft, the "trail" along the East Ridge deteriorates into a number of meandering interconnecting climbers' paths and erosion gullies, and progress slowed on the steep scree and rock. The final 200 ft was again mostly snowcovered, and we reached the 9495 ft summit just after 1pm. Views were spectacular in every direction, including directly down the steep North Face into the northern glacial cirque with its numerous rock towers, the eroded remnants of the lava conduits of the McLoughlin volcano. We considered skiing the North Face, but to exit the bottom of the bowl near 7500 ft would have required a substantial climb to the 7900 ft notch connecting it with the northeast side. Since the NE Face was nearly as spectacular and much more direct for getting back to the trail, we settled on that route instead. We skied directly off the summit at 2pm, snow still extends higher than the summit rocks and nearly as high as the remnants of the stone foundation of the former lookout tower. We skied a traverse east for 100 ft to reach the steep roll at the top of the NE Face. The slope was 40+ degrees, but options reaching 50-60 degrees could be found on the back side of the convex roll. The snow was perfect, smooth and fast corn, an absolute delight after the mixed bag of snow conditions on Shasta. The NE Face holds 35-40 degrees for a long pitch, gradually easing to 30 degrees and less below 8000 ft. The scenery is stunning, I had forgotten how amazing the rock towers and formations are in this bowl in the 5 years since I had last skied it. We skied the delightful slopes directly under the awesome precipices towering overhead, and surprisingly there was little fallen rock visible on the smooth snow. Snow stability was excellent, we set off a tiny sluff on the steepest part of the upper roll, but nothing else on the rest of the slope. Below 7500 ft, the bowl flattens and snow coverage becomes intermittent with numerous bare ridges of glacially-deposited debris. From the summit, we had scouted what looked like the most continuous snow-filled gully, and we followed it down towards the right side of the slopes, ending in a large open pit at 6900 ft at the edge of the forest. A quick descending traverse south and SE through the open forest brought us back to the summit trail near 6600 ft. What a spectacular day, 2600 vft of exceptionally fine skiing in a remarkably scenic setting. The awesome Northeast Face of Mount McLoughlin reflected in the mirrorlike surface of Fourmile Lake. Our ski route drops directly down the face from the summit. Click here for an enlarged version of this photo.